Opening with a wordless ten-minute sequence that places its main character firmly in the movie’s physical setting, Maine is a low-budget indie offering with a surfeit of ambition that is only fitfully exploited. On the surface, it’s about Bluebird and her search for some kind of meaning to her life – the reason she’s left Spain and her husband is never revealed – but as Matthew Brown’s debut feature (he also wrote the script) unfolds with slow, painful deliberation, whether this is really the case becomes open to question. Much of this is down to Bluebird’s wayward behaviour and the inconsistency that punctuates the time we spend with her. And though it’s always possible that said wayward behaviour could be indicative of a mind that is struggling to make sense of the thoughts inside it, because Brown chooses to make Bluebird’s motivations more ephemeral than concrete, the viewer has no choice but to interpret matters on their own and hope for the best. For many this will mean a frustrating, disappointing viewing experience that tests their patience, and much like Bluebird herself, will mean whether or not they see things through until the end. Though Brown may be aiming for ambiguity, when it’s all there is, it’s not as satisfying as it might sound. This being essentially a two-hander – other hikers and later, a handful of townspeople, drift in and out of the narrative – much depends on the performances of Costa and Mann. Costa made a big impact in Victoria (2015), and since then has made consistently interesting choices, but here she’s saddled with a character whose arc goes nowhere (though that may be a deliberate choice – who knows?). As a result she gives a spirited yet mannered portrayal that hints at Bluebird being bi-polar, while Mann can only respond by looking confused, upset or defeated by her often callous attitude towards Lake. Their relationship flits between friendly and adversarial, optimistic and regressive, but with all these disparate elements in play it’s hard to know which are sincere and which are diversionary tactics employed by Brown to give the semblance of greater depth to the characters and the material overall. 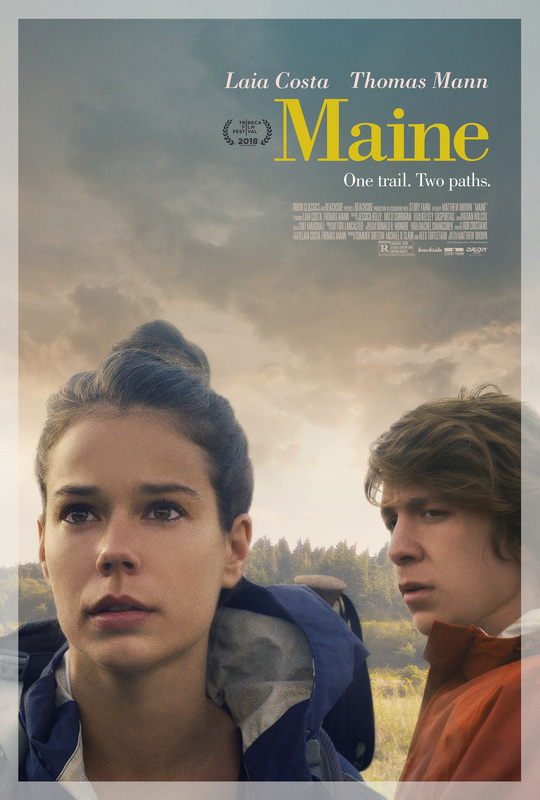 In the end, and despite everyone’s best efforts, Maine remains the kind of movie where getting to know and understand the main protagonists feels as if more effort is required than is necessary, and Brown’s directorial choices serve only to highlight how distant Bluebird and Lake remain from an audience that can’t really connect with them. Rating: 5/10 – an unsuccessful foray into “trail movie” territory that hints at long-buried emotional traumas in both its main characters, but which refuses to explore them except superficially, Maine undermines audience expectations at every turn by remaining oblique and often dramatically inert; blessed though by Donald R. Monroe’s movement of the camera, and a succession of perfectly framed shots of the Appalachian Trail itself, this will no doubt have its supporters, but this is one time where the Emperor really has forgotten to dress himself before going out in public. 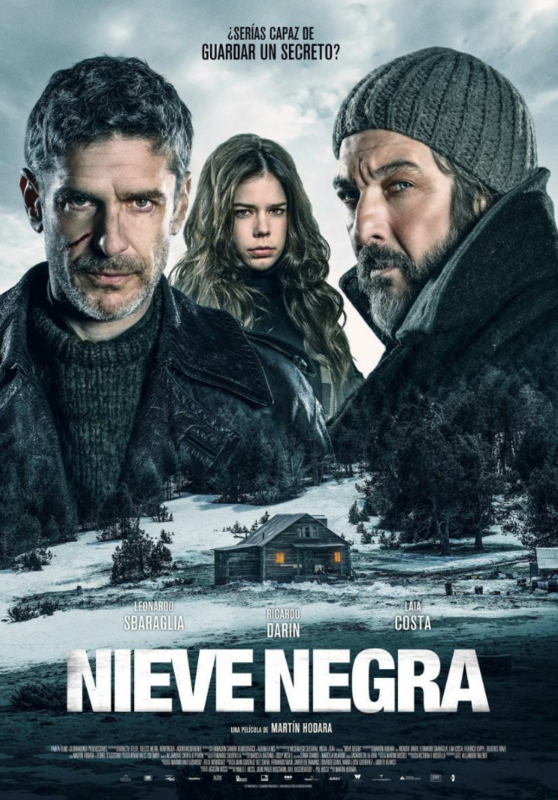 With family tragedies – and the inevitable dark secrets that seem to go with them at every turn – fuelling so many movies over the years, Argentinian thriller Black Snow has its work cut out for it before it’s even started. But while it doesn’t offer anything that’s particularly striking or original, it does have the benefit of its Patagonian setting, and a strong cast whose performances contribute greatly in making the viewer overlook how predictable it all is. 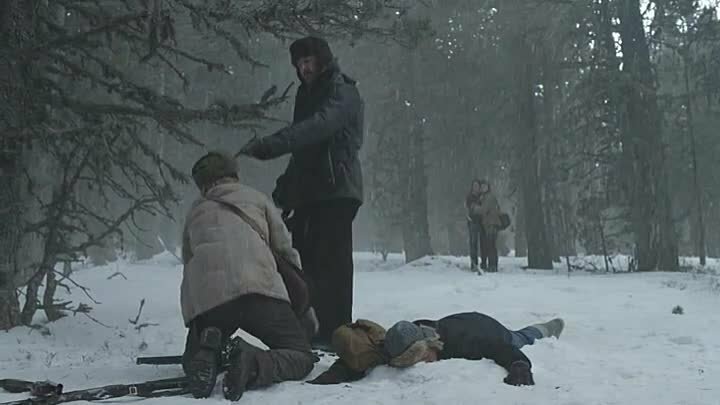 It also takes great care through the various flashbacks that pepper the narrative, in revealing just enough about what happened the day Juan died, but without giving the viewer too much information to help them work out the why. Sharp-eyed and -eared viewers – or just those who have seen one too many of these kinds of thrillers – will be able to work out who did what, but this doesn’t spoil anything going forward, and the script – by director Hodara and Leonel D’Agostino – works hard to concentrate on the characters and their fractured relationships instead of making it all about the mystery surrounding Juan’s death. Away from that central mystery, there is still much to keep viewers occupied, from the sad fate of Sabrina, her brother’s death having scarred her to the point where she’s retreated from the world, to the legacy that their father has bequeathed them all, one that encompasses unhappiness and emotional distance. Marcos initially seems to have succeeded in avoiding the effects of their father’s legacy but his marriage shows signs that this isn’t the case, and as the movie progresses and he fights to maintain his own fragile equilibrium, whenever Laura challenges him about his behaviour or what happened all that time ago, you can see the façade that he’s so carefully hidden behind for so long begin to slip. For his part, Salvador is reticent and unhappy with Marcos’ attempts at further marginalising their shared tragedy, and the idea of selling their childhood home fuels the anger he’s kept at bay in the intervening years. And when Marcos finally goes too far, both brothers’ actions have unforeseen consequences. The snow-covered mountains of Patagonia serve as an effective backdrop for the icy interactions between Marcos and Salvador, and the wintry weather also helps to highlight the simmering emotions that both brothers are trying to keep in check. (That said, a scene where Marcos’ and Laura’s car ends up stuck in a snowdrift, and they remain there until nightfall, sees a mistral-like wind suddenly spring up, and then just as quickly disappear once they reach safety.) It’s all shot by DoP Arnau Valls Colomer with a view to increasing the sense of isolation that these characters are experiencing, both within themselves, and as a result of where they are. Hodara takes care to make sure all this isn’t shown in a way that could be construed as heavy-handed, and as he teases out the various strands of the narrative, the overall effect is maintained and built on until those same strands are pulled together into an ending that offers both closure and ambiguity. The final shot may have some viewers feeling that they’ve had the rug pulled out from under them, but there are clues that support the ending, and in terms of the narrative and what’s gone before, there’s a psychological underpinning that works well in supporting it. It’s also a moment that leaves you wanting to see what happens next, something that doesn’t always happen in this type of thriller, and if there is to be a sequel of some sort (though it’s unlikely), and if Hodara and his very talented cast do return, then the story really needs to be locked in before everyone’s on board. On the evidence here, though, the cast would be the least of Hodara’s worries. Darín, as usual, gives a terrific, detailed performance of a man living under a terrible shadow, but who is still able to retain an innate dignity despite what he’s done (which isn’t as straightforward as it seems). As his unwanted nemesis, Sbaraglia exudes a callous disregard for others that shows Marcos is more self-serving than he would ever admit, or want others to realise, and it’s in his scenes with Costa that this becomes more and more evident. Rounding out the main cast, Costa too is good in a role that seems like it’s going to be yet another “female character ignored by the plot” arrangement, but Laura proves integral to said plot, and Costa makes her determined and not at all vulnerable – which is a nice change. The pace of the movie is measured, with the aforementioned flashbacks layered into the narrative at appropriate points, and the tone of the movie is suitably dark and gloomy, infused as it is by references to fratricide, mental illness, abuse, and emotional pessimism. It’s not a cheerful, sanguine movie by any means, but it tells its story in a way that maintains interest and keeps its central mystery exactly that – a mystery – until the final fifteen minutes. There are times when the material feels a little strained, and Hodara and D’Agostino seem to have painted themselves into a corner in terms of allowing the story to unfold organically, but these instances don’t hinder the movie too much even though they are noticeable, and the story is strong enough to press on without suffering any “ill effects”. A compelling thriller then, and one that has more than enough going on to attract even the most casual of viewers. Rating: 8/10 – a neat psychological mystery that doesn’t feel like it’s trying to trick the viewer or string them along until a big twist is revealed, Black Snow is a confident, darkly agreeable movie that works hard to make its characters credible and their story more believable still; another winner from South America, and further evidence that movies from that part of the world deserve a wider platform on which to shine. NOTE: The trailer below doesn’t have English subtitles, but it does enough without them to give you a good idea of what the movie is about, and its themes.